Chi va sano, va lontano. 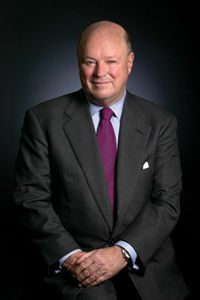 Ambassador Frank G. Wisner provides clients with strategic global advice concerning business, politics, and international law from the firm’s Washington and New York offices. Ambassador Wisner’s diplomatic career spans four decades and eight American presidents. He served as ambassador to Zambia, Egypt, the Philippines, and India during his extensive career in the State Department. As Foreign Affairs Advisor, Ambassador Wisner plays a pivotal role at the firm, leveraging his vast experience in the Middle East, India, Europe, and Asia to assist the firm's domestic and international clients. In addition to his role as ambassador to four countries, he has served as Under Secretary of Defense for Policy and as Under Secretary of State for International Security Affairs. Ambassador Wisner was senior Deputy Assistant Secretary for African Affairs from 1982 to 1986, a time of intense diplomatic engagement in Southern Africa. After graduating from Princeton University in 1961, Frank Wisner joined the State Department as a Foreign Service officer. His first post was in Algiers immediately after it won independence from France. He then went to Vietnam, where he spent four years at the apex of the war. Ambassador Wisner worked as a senior diplomat in Tunisia and Bangladesh before returning to Washington as Director of Plans and Management in the Bureau of Public Affairs. He joined the President’s Interagency Task Force on Indochina, the entity responsible for evacuating and settling nearly one million refugees and served as its Deputy Director. Later, as Director of the Office of Southern African Affairs, Frank Wisner worked closely with Secretary of State Henry Kissinger to launch negotiations with Zimbabwe and Namibia. Secretary of State Condoleezza Rice appointed Ambassador Wisner as the nation’s special representative to the Kosovo Status Talks in 2005 where he played a crucial role in negotiating Kosovo’s independence. Before joining Patton Boggs, Ambassador Wisner served as Vice Chairman of External Affairs for American International Group. Professional Affiliations: Board of Directors, U.S.-India Business Council; Board of Directors, EOG Resources Board of Directors, Ethan Allen; Vice-Chairman, Business Council on International Understanding Trustee, the American University of Beirut and the American University in Cairo.